Toraya is a small restaurant that has a handful of tables on the left side of the single room and a few seats at the sushi bar on the right. The decor is calm and soothing, with blonde wood and traditional Japanese lamps giving the place a nice feel. 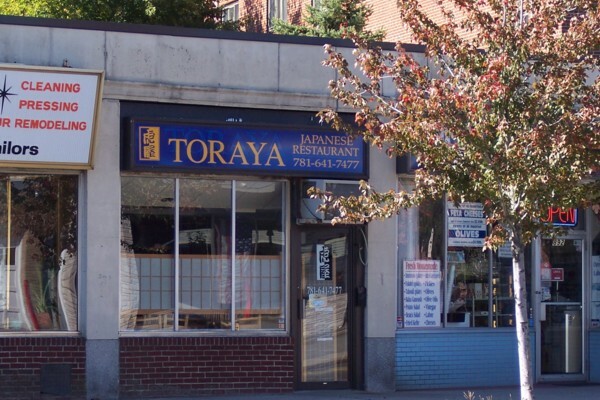 Toraya typically has only three or four people working there at any given time, including someone behind the sushi bar, who makes his incredible concoctions while people sit and watch. Some of the more familiar items here include a terrific version of tekka maki (tuna), an excellent salmon caviar, red snapper, mackerel, and shrimp with roe (this last one being a real highlight here). If you want to try several items, Toraya has combination plates that may be the way to go for you. There are some more exotic items on the menu here as well, include a briny (and very tasty) flying fish roe, raw quail egg, and tile fish. For those who are looking for vegetarian options, Toraya has several, including a delightfully crunchy asparagus maki, a mild and perfectly textured yam maki, a slightly sweet cucumber and plum maki, a wonderful plum and beefsteak leaf maki, an earthy-tasting shitake mushroom nigiri, a creamy avocado nigiri, and a rich tamago (egg sushi). Folks who are not sushi lovers still have good reason to come to Toraya, as the restaurant has a number of entrees for diners who like steak, chicken, pork, tofu, or noodles. Specific items on the menu include chicken teriyaki, deep fried pork loin, and veggie tempura. One item that is outstanding is the gyoza appetizer, is a plate of pork dumplings that are pan-fried until golden brown and almost literally burst with flavor. Another dish that really stands out is the mouthwatering sukiyaki, which is thinly sliced beef (very lean) with tofu and vegetables, cooked in a sweet, delicious soy-based sauce. If you like lean beef, this version of Japanese comfort food may be worth looking at. After all these years, Toraya still isn't well known, and its location makes it easy to overlook, but the restaurant does seem to do pretty well; on any given night, the place is crowded enough to warrant a short wait. But it seems that mainly locals, Japanese Americans, and serious sushi lovers are the ones who are going to Toraya. That may change, however, as the food here is simply too good to be kept a secret for too much longer. Copyright © 2006-2015, Boston's Hidden Restaurants (www.hiddenboston.com).